Before I get into the recap itself, I just need to do a little CELEBRATING!! This race marks my TWO YEAR RACE-IVERSARY! Top 2 pictures are from 2012 and bottom 2 are from 2013 DL Half! 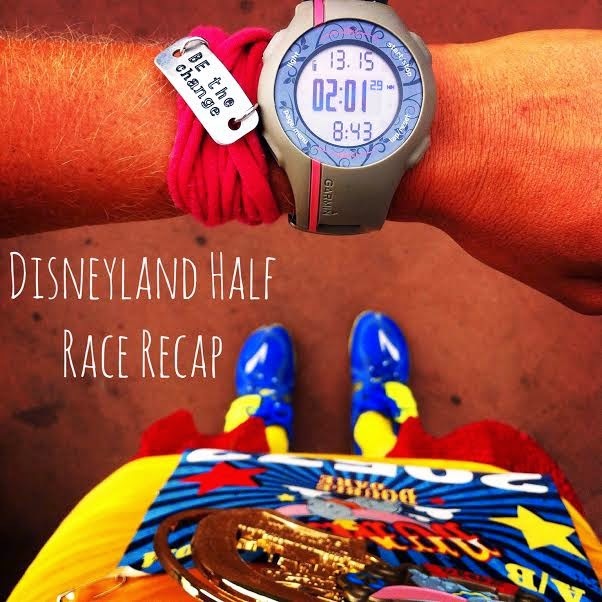 But first, just in case you missed PART ONE of the Dumbo Double Dare Challenge - the Disneyland 10K Race Recap, make sure to check it out here. And without further ado, ON TO THE MAIN EVENT! I had been chatting with some "friends" about meeting up before the half and I am SOOOOOO gladit worked out. Of course the 4:30am meet-up time was early, but WELL worth it! 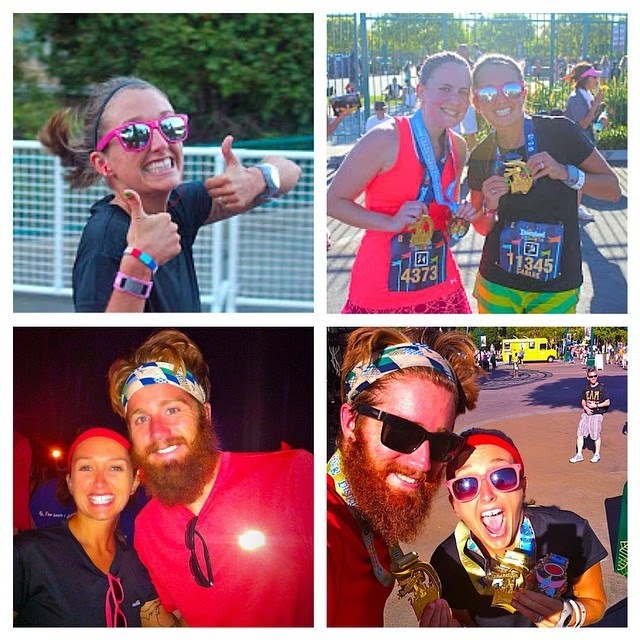 I LOVE when social media/ running friends turn into REAL friends! I was able to meet so many amazing folks (and of course take a couple pictures ;)). We had a whole mini-meet-up goin' on! Thanks for the picture Shelby!! 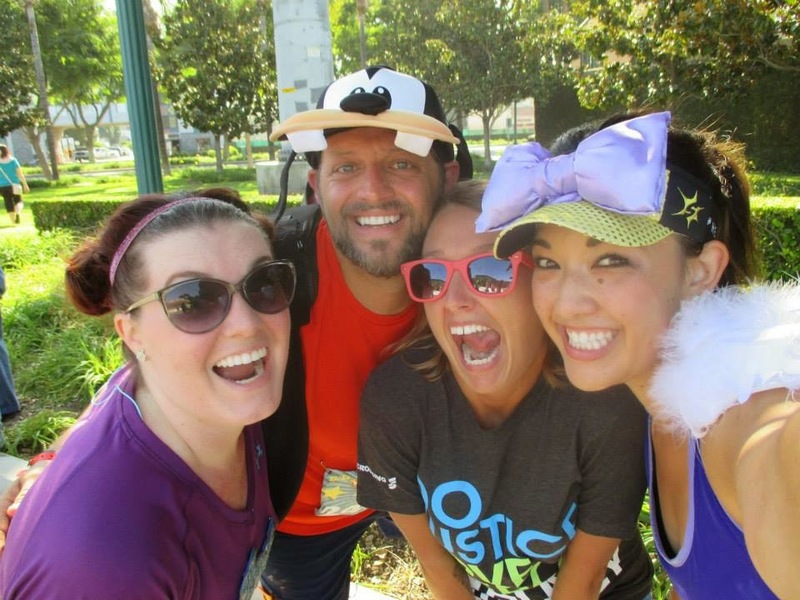 Ivie (Daisy Duck), AJ (Goofy), Kara (Darla from Finding Nemo) and I (Tweedle Dee). Thanks for the picture Kara!! to see Henry in the same spot BOTH mornings?! Thanks for the picture Henry!! 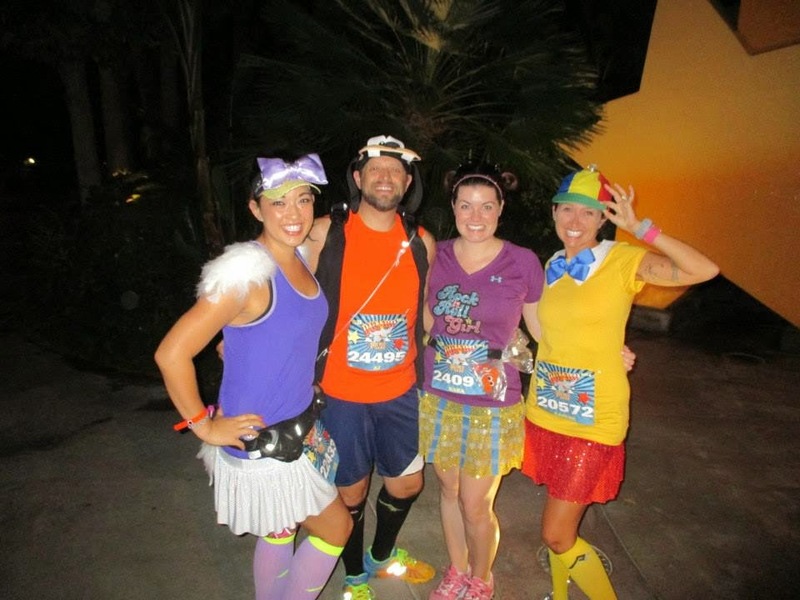 Casey, an AWESOME runner who lives in Las Vegas who I knew through Instagram, was going to be in Corral B and when I asked her about the pace she was planning on running I decided it would be GREAT if I could run with her. In the corral I was able to chat with Cory for a bit and then went looking for Casey. FOUND HER! We were both shooting for 8:30-9:00 minute mile pace (and crossing our fingers for sub-2 finishes), so it was terrific to have found her AND to be able to run with her. pretty thick at this point... SOGGY! We started off strong. My goal was to try to beat the sun. If you have run the Disneyland Half before you know there is a stretch of the course where you are running directly into the rising sun. I figured the faster I went, the more likely I would be to miss that part. The first three or four miles are in the parks. 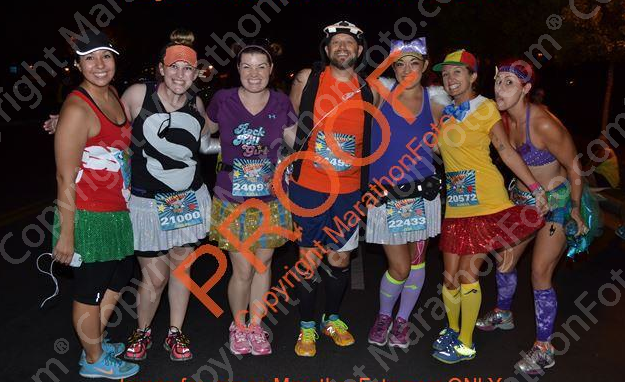 They are high energy, your legs are fresh (well, mine weren't 100% fresh, since I had run the Disneyland 10K the morning before, but you know what I mean), and your adrenaline is going. While we were in the parks I lost Casey for a bit (I think she stopped for a picture), but thankfully she caught up to me later ;) I didn't stop for any pictures, but did want to note there were more characters on the course than the previous day (THANKFULLY... of else runDisney might have been in trouble ;)). Once I left the parks I pretty much hit a WALL. 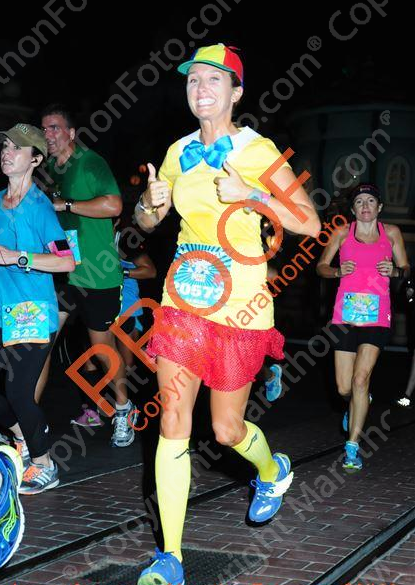 The humidity was taking a LOT out of me and my Tweedle Dee shirt (which was 95% cotton - BAD IDEA) was drenched! I decided I needed to cut back my speed a bit or I would be crawling over the finish line. I'm not sure if you remember my post with the Run With Perseverance tanks or not (if you don't, check it out here), but Kathy is the owner of the company. 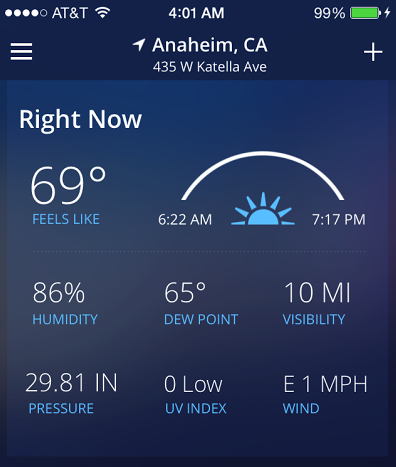 I was running through the Classic Car section before you get to the Honda Center and I saw someone wearing one of her tank tops. Well, LOW AND BEHOLD, IT WAS KATHY! 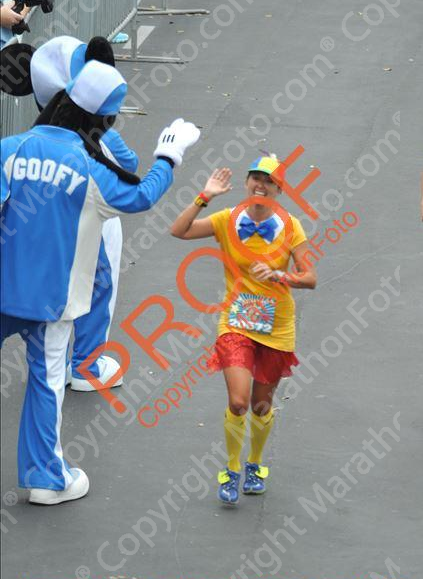 She chased me down, got a sweaty hug, and ran next to me for a bit while we chatted! It was so wonderful to meet her out on the course! [Maybe I should have had her make me my tank, then I wouldn't have been so sweat-tastic ;)] Oh yeah, and this is where Casey caught back up to me. 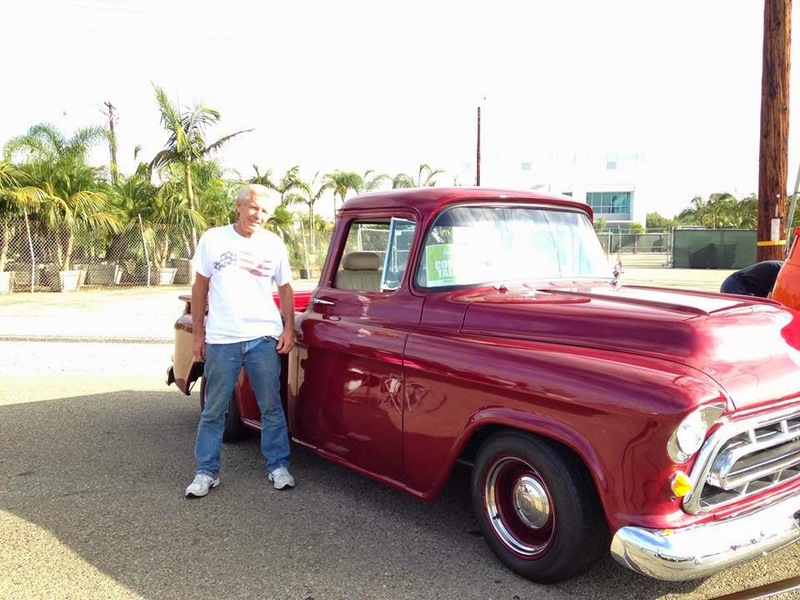 Kathy's dad and his PURRRRRRRTY 57 Chevy! Thanks for the picture Kathy!! As you can see from my times, I just continued to fade... By about mile 9 I was DONE. 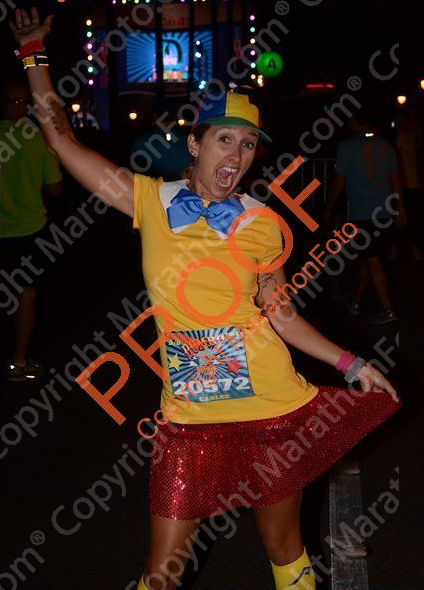 My legs were tired, I felt like I had lost 5 pounds of sweat (okay, okay, maybe I'm being a little dramatic ;)), and was just ready for the race to be over. Thankfully we ran through the Angel's Stadium around this point. It was just the (temporary) boost I needed. So many boy scouts and girl scouts cheering for us. It is one of my favorite parts of the course! The stadium felt extra full this year (I was actually worried we wouldn't be able to run through it because I thought there was a baseball game on Sunday and wasn't sure when batting practice would start). After the Angel's Stadium Casey started pulling away and I decided I'd let her. 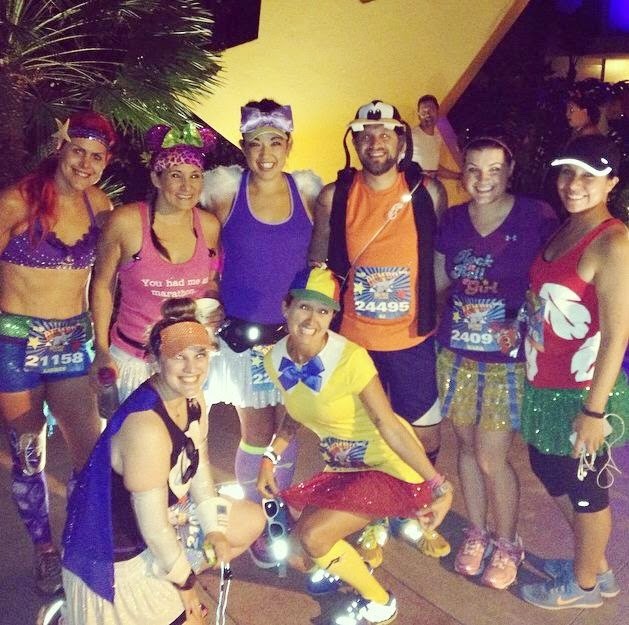 Yes, I may have been able to push myself a bit more, but runDisney events are all about the memories and magic (not necessarily about the time on the clock) and I really didn't want to hurt myself before starting up my next round of Marathon training. At that point I just sort of wanted to throw in the towel, so it was a HUGE mental game I had to play the last 4 miles. Telling myself everything from "Don't let the spectators down" to "I don't want others to see my give up and walk" to "You can walk when you are done" to "YOU FREAKIN' GOT THIS" (RunEMZ's mantra ;)). I was actually super proud of myself for NOT walking (I walked through the water stations, but that's more because I can't run and drink out of a cup at the same time). I was able to cross the finish line at 2:01. 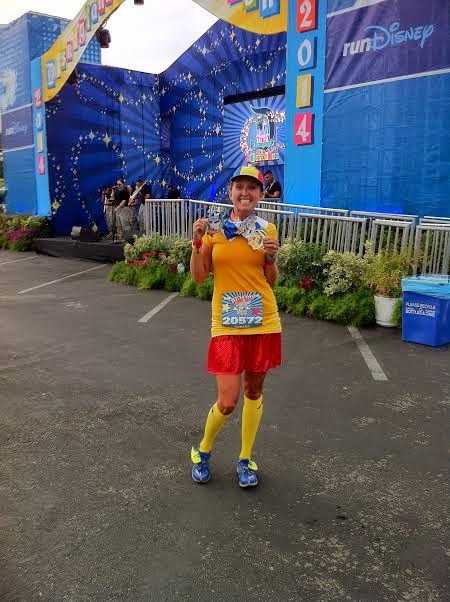 It is a little over 10 minutes slower than my fastest time (which I got earlier this year at the San Diego Half Marathon), but with the conditions, the large crowds, having raced the day before, I can't be too upset with the outcome. 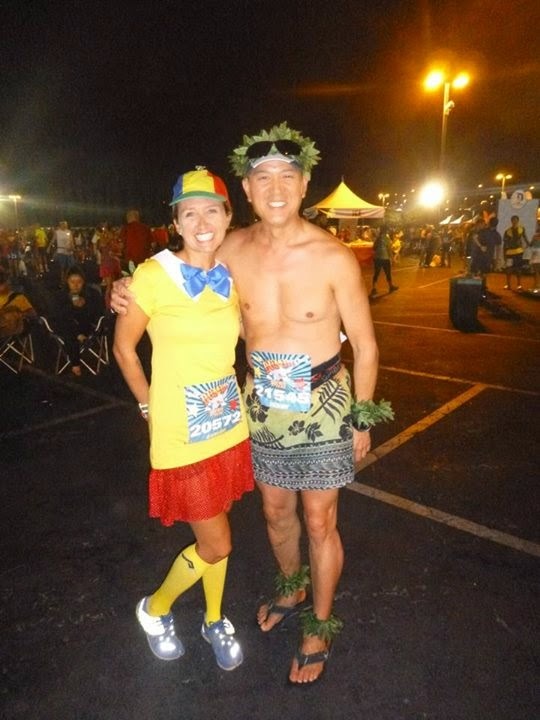 You never know what race day will look like... You can prepare and prepare and some days it just isn't meant to be. TALK ABOUT POSITIVE SPLITS, WOWSER! 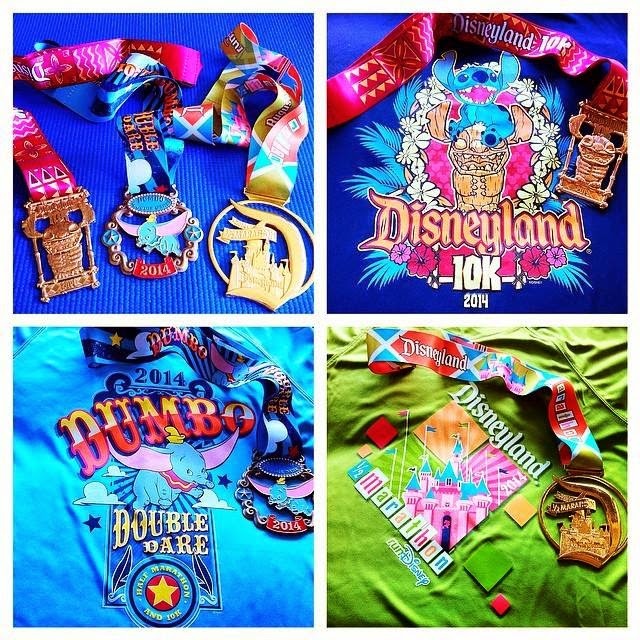 Casey waited for me cross the finish line so we could collect our medals together (I got the Dumbo Double Dare medal as well as the Disneyland Half medal because I had completed the challenge of running the Disneyland 10K the morning before). We took a couple pictures and then I decided I would head back to the hotel to shower (I felt pretty disgusting). THE BLING! And participant shirts! Remember my friends from earlier in the morning? Ivie, AJ, and Kara? Well, I had messaged Kara to see where they were at on the course and when I got the info I decided to head back down to cheer them on! 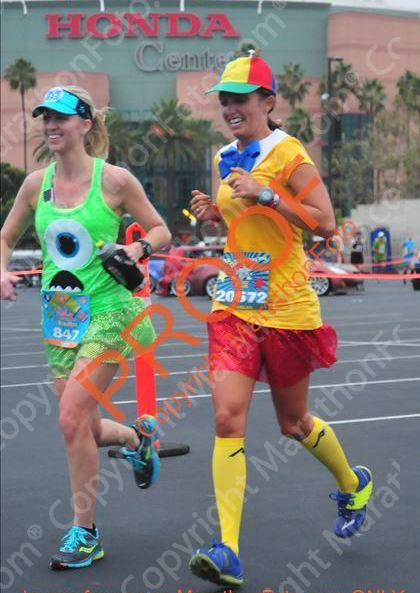 I was at Mile 12 for about 45 minutes cheering on everyone I could. (At this point the sun was up, it was extremely steamy, and you could see the exhaustion on every one's faces... which is why they needed our encouragement even more!) While I was there I met Ty (he ran past and then said "I KNOW YOU" and turned around) and got to cheer on Ivie, AJ, and Kara (AND GET SWEATY HUGS :)). Thanks for the picture Ivie!! Screen shot of CRAZY CARLEE! Or maybe I was doing the "Darla" smile - HA! Aren't running friends THE BEST?! Still a great time considering you ran the day before and the heat. Way to go C! Trust me...I know that song and dance all too well fren. Like you said, we will get there. Way to go! Awesome time :) You're right, running is all about having fun. Congrats on making the video! Looks like a great time! Love your costume! Ha! 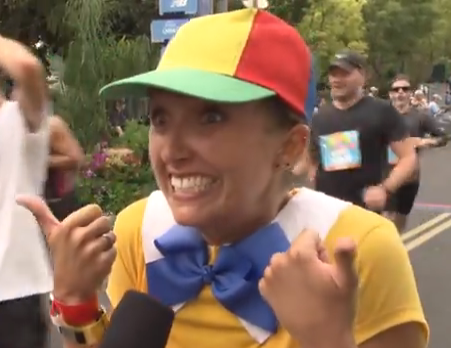 I love the idea of you "acting" crazy in the interview to go along with your costume - too funny! I had a tough race too (at least you didn't face plant halfway through the race like I did! 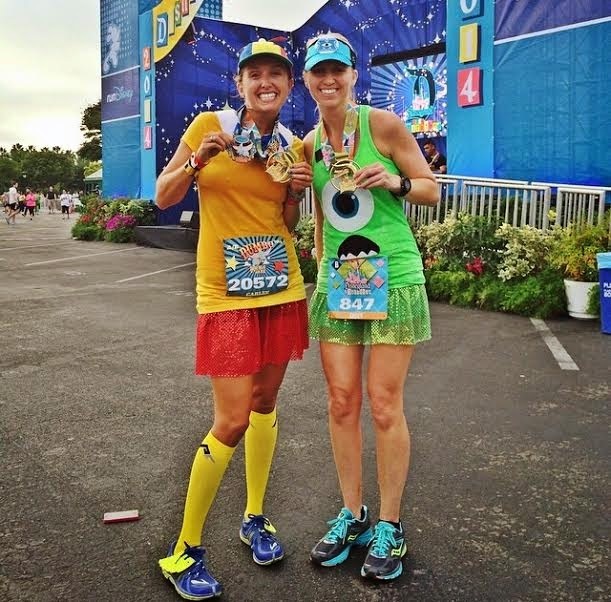 ), but I agree that runDisney races are for the experience, not for time - I make it a point to never try to PR at a Disney race. I'm SO glad we got to meet quickly before the 10k, we'll definitely have to plan to get together in January!